Walking four miles on cement sidewalks with bare winter feet may lead to skin loss on the bottom of your toes. Just saying. Realization. It's worth any slight skin loss to walk barefoot on the last day of February! Too quickly, that option will be a memory! Reality will return and I will quickly fall into the "holy crap but it's cold" mode. I do count my blessings. I know how lucky we are to be able to do what we do when we want. I know how lucky we are to have amazing friends. I know how lucky we are to have a cold hometown to which we may return. And I know how lucky we are to always enjoy the warmth of the people we love, regardless of skinned toes and/or gorgeous/crappy weather! It was a foggy start to the day. 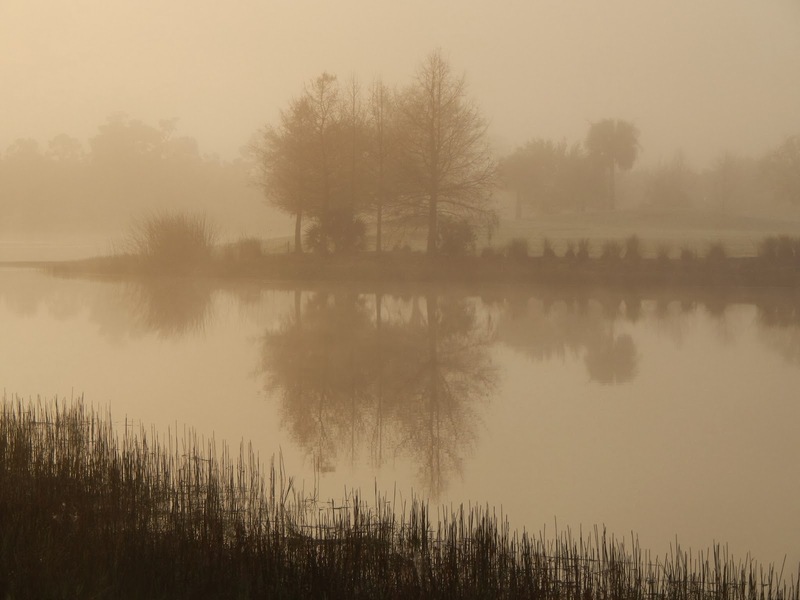 Despite the lack of sun to brighten the morning, there was also a noticeable lack of wind, resulting in an eerie duplicate across the pond. Something in me revels in reflections, and this one just captured my camera. The stories that I could contrive...the imaginary scenarios I could construct.... But the sun came out. The wind came up. And the inviting stories and scenarios dissipated. But thanks to the camera, the effect endures. And I will remember. Know you are loved! We're in the Mucky Duck, enjoying a grouper sandwich, when I survey our surroundings. If one is eating in an establishment called the Mucky Duck, one is well advised to do this very thing. There are all sorts of exhortations and suggestions as to how one should live his/her life. Over the emergency exit door is a sign that says "keep calm and carry on!" Appropriate. But it was while we were leaving that I noticed the above plaque. I was so taken with it that I didn't even take the time to crop the picture. Perhaps it goes to the point that of all the signs, this one to me was the most important. 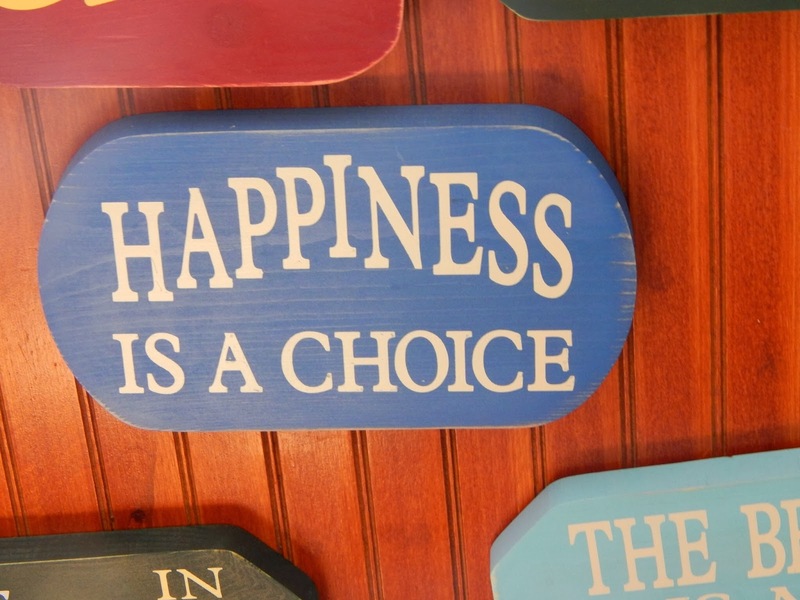 I've heard it said that people are about as happy as they choose to be! I buy this. I do wonder then why some choose to be unhappy...to see only the burden, the seemly side of life? I chose my career. It made me happy. I chose my life partner. She makes me happy. I chose to visit Florida in the middle of this amazingly brisk winter. It makes me ecstatic! I've said it before. When it hits the fan, it's not evenly divided! When I get more than my share, I choose to use it as fertilizer and hopefully grow from the experience. So it has been written (at least on the door of a pub on Sanibel island), so it must be done! By the way I choose to share this with you, and hopefully it makes you happy! Know you are loved! We headed out this morning intent on doing some shelling. 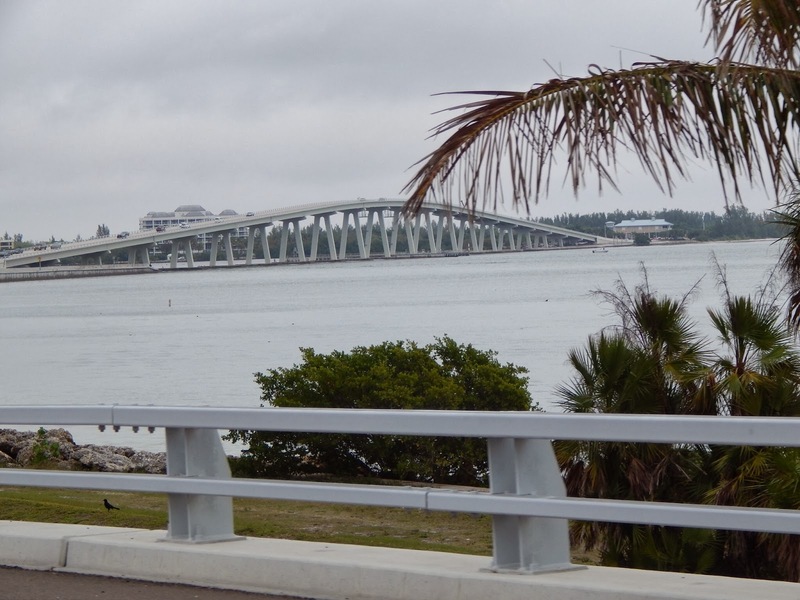 From Fort Myers to Sanibel and Captiva, the route includes the bridge above. (Go figure. We're going from the mainland to islands. A bridge is a handy way to do that!) As we are crossing the bridge, I realize I have always had a fascination with these structures. Whether it is a walking bridge, suspended over a chasm or a highway bridge suspended over water (or in South Dakota, a culvert or a train track), the allure of what is on the other side always pulls me. Someone, at some time, must have thought there was something worthwhile waiting on the other side, else why go to all the trouble? Here's the thing. The same bridge that takes you to the promise of great things to come also takes you home again! Indeed...something good on the other side! Life's like that. New and exciting add adventure and learning. Comfortable and well known add stability and security. I like both, so I will continue to cross my bridges...both ways! May the spans in your life provide you with knowledge and safety, and know that on both sides, you are loved! two beautiful egrets walking past, as if they had every right to be here. The sky is a gorgeous azure blue with white wispy cirrus clouds. The water is rippling with a pleasant breeze. The turkey vultures are circling overhead. I am sweating from an amazing run on dry pavement through the community center, around the tennis courts and just off the nature preserve! In short, comparatively speaking, heaven on earth. Psychologically speaking, the healing has begun. There is no way to thank miss Ludie for hosting us. And I can honestly say, I wish you were here. You, however, WOULD have to rely on the kindness of strangers, cuz we have this place!! Know how much you are loved! They were all so young. And they had been given the task of protecting our country...overseas! I was overwhelmed and awestruck, not to mention appreciative! Great audience, paying attention and laughing in all the right places! The speaker to follow me was a professional from Mikwaukee. Also young! The title of his speech was "Can I kiss you?" I had the perfect lead in to his speech, and then, as is often the case, I ran out of time. Go figure. I was going to say, if you talk nicely and buy me a drink... Maybe it is best that I ran out of time. Anyhoo...we have alit In Sioux Falls. Our two room suite for the evening (Who says there aren't perks to frequent flyer miles...gotta love the automatic upgrades!) will do, and have requisitioned our vehicle to take us to the airport tomorrow morning at oh my god 4:00 am. Tomorrow's blog, with any luck at all, will come to you from warm and wonderful Ft. Myers. Rest well knowing there are people willing to protect and serve, and know you are loved! I have had the privilege to address the Yellow Ribbon Guardsmen programs in the past. There are no words that can capsulize the admiration and thanks I have for these men and women for everything they have done/continue to do that allows us to do what we continue to do! I have, however, felt sorry for the amazing staff that has had to sit through the same old stories. What a surprise they are in for when I tell them my leprechaun story and the events at the convent of St Mary's. Much to the chagrin of my espoused, I have been practicing these over and over by telling them to anyone who will listen! I think I have them timed! Should we ever meet in person, and you ask (Hah! There's probably no way I'll wait for you to ask! ), I will share them! Tomorrow, with any luck at all, we will Laugh! We will Learn! We will express our Love. And we will do our best to Leave a Legacy! As to the penultimate item on the list, you are! When I started my web page, oh so many years ago, I started jotting down truisms to share. As with most things, that excellent idea quickly dissipated and eventually faded away. As I was looking for a recipe for dessert tonight, I decided to revisit some of those thoughts, and one stood out to me. "The happiest of people don't necessarily have the best of everything...they just make the most of everything that comes their way." I get to talk to another group of South Dakota national guardsmen this weekend, and I will tell them my primary belief...we are/become the sum of our choices! How we choose to react to what comes our way governs the heights to which we will ascend. We should not covet that which does not come to us. Develop that which does into a positive place to be. This may be Pollyannaish (but if you are a frequent reader, you know that is what I am! ), but with work and willingness, I believe it is attainable. How's that for a Philosophical Phriday? Of course I hope all things that come your way are positive! Let me start the trend. Today, what comes to you is my love. Do with it as you will. In the best scenario, you will pass it on! Of course, I have no idea whether day lilies will be blooming in Florida when we get there or not. I do know that whatever is blooming will be chronicled and shared. The last three days have really instilled in me the need for warmth, sun, and dry pavement. Visiting the plethora of flower pictures embedded on my camera just whets my appetite for more. It's a shame I choose to tease myself, right? With three days to p-day (that would be plane day) Gloria Gaynor lives in my head...I will survive! Pictures and gloating to follow! Until then, know you are loved! There is no doubt. The topic of conversation this winter has been the weather. I am guilty as most having witched and moaned more than necessary about that over which we have no control. But you have to agree, it hasn't been an easy time to smile. Well, today it simply was not possible to go anywhere without a comment...and that elusive smile! I remember 39 last fall was really cold. It truly is a matter of perspective! With that in mind, as the snow and cold return tomorrow (according to the weather man who if there were interactive television would be accustomed to my "gesture" of response! ), I hereby pledge to view the weather as a fact of life, and change my perspective. Of course, that's a whole lot easier knowing we will be going to Florida on Monday! I will send you warm while I'm gone! Remember mother's smile and know it will return again. Until then, revel in the warmth of my love! It started out on a positive note. My sister-in-law gave me a new pair of bright red sweat pants for Valentine's Day. Perfect for the "look at me" type of runner I am. If I have to suffer, I want the world to know that I'm doing it, and bright red kind of lends itself to that motif. Anyhoo, when I get new clothes that are utile, I like to spread the joy around, so yesterday, I wore my new pants to bridge. To give you an idea of my usual bridge attire, no one commented. Went to Jenkins to visit Eddy, our aunt. No one commented. Okay, I can live with that. Woke up this morning knowing that a run was in my immediate future, so on go the red sweats. As I was leaving the front porch to make breakfast, Cath called it to my attention that I had neglected a tag. There, on my derriere, was a paste-on tag with the word LARGE in big bold print. Seems as how I hadn't found all the clever tags put on at the factory. Now, I would have been embarrassed by this, but in actuality, the tag was accurate! So to all of you who were just being polite yesterday, thank you. I have removed the tag. I am going to replace it at some time with one of my own. It hopefully will say, BUT NOT AS LARGE AS IT HAS BEEN! May your search for tags be complete. May you smile just a little. And always know that you are loved! A thing of the past. If I don't write it down, put it on the calendar, or beg someone to remind me, I will forget! Today is the perfect example. We're sitting at bridge and someone comes up and says, "I suppose you have the fudge ready for Town Players." As you may surmise, she was a bad guesser! I had said I would have it ready today. Well, I can keep my word, but only because I came home and went to work immediately! Four pans of fudge are done! Now, I have to remember who wanted them! No worries. It'll come to me! There is one thing I will never forget! You are loved! Hard to believe a computer teacher, technophile like me would say something like that, isn't it? That certainly wasn't going to be the title of today's opine! Oh no, I had just about finished my treatise on personal balance when, through some unknown keystroke, I sent it into ether heaven, and my powers of resurrection cannot seem to retrieve it. Floating out there somewhere is an amazingly clever and lucid discourse on physical and emotional balance. But alas, it is gone. I can prove, however that I have a little of both left, because when I stood up to throw this contraption against the wall, I didn't fall over, and in the lengthy process of standing, decided it would be slightly immature to destroy the machine when we all know it is the user who was at fault. Now, if that ain't balance, I don't know what is! So instead, you get this! But I feel better, and before it to goes good bye bye, I save, and wish you good night! Know you are loved! Have you ever noticed how some things simply become part of your life? 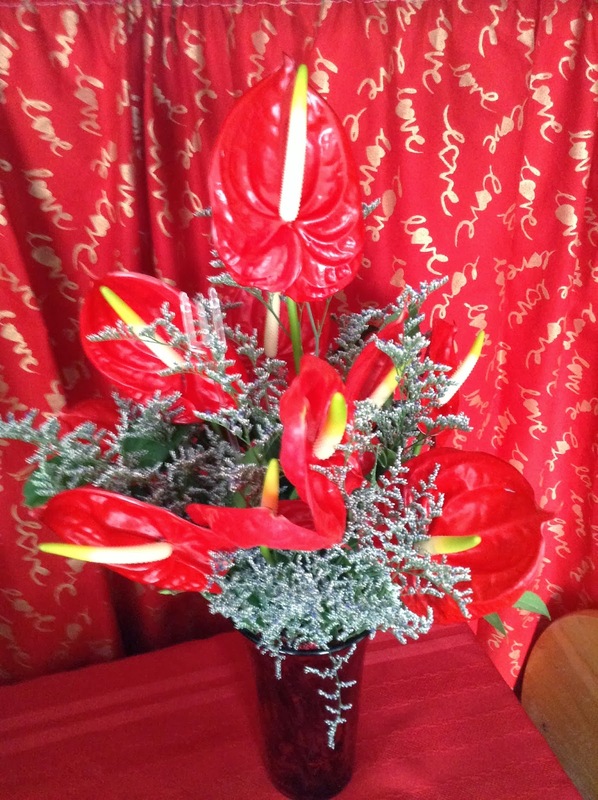 For some reason, the anthurium has come to symbolize the love I have for mi esposa! I would analyze the process. It's a beautiful flower, representing the beauty that is Cathryn, both visually and spiritually. She is the entire package. It's a heart shaped flower, and she captured that anatomical part of me over forty years ago. It travels far to get here, representing the joy we have found in each other as traveling partners...on vacation...through life. It is her favorite color. Enough analysis! It's been said that the heart wants what the heart wants. My heart wants to spend the rest of my life with her. So she gets anthuriums. And she gets my heart. And she is my love! On this, the 14th of February, 2014, you would guess my blog would be a glorification of St. Valentine, the saint of courtly love. Somehow, there is probably no more appropriate holiday for me to celebrate. However, your guess would be incorrect. While I advocate the teachings of St. V, I today sing the praises of St. Martin! You see, it was St. Martin who inspired his flock in Watertown to build a church in its current location. It was St. Martin who somehow directed his flock to open the door to the worship center this morning, and it was St. Martin who, in the ultimate foresight of Christian love, directed that flock to include a bathroom easily accessible to any and all runners who found themselves in need! Sometimes, the practical just outweighs the ethereal! Because of St. Martin, I can comfortably spread the word of St. Valentine. Celebrate every event as a building block to what you will become, and know always that you are loved! Happy VD! Due to an age factor, too many beers as a freshman in college, and a stubborn refusal to check back, I noticed that twice in the last week I have had problems with coffee. That is not abnormal. I have learned to live with my shortcomings in certain areas. (It would be at this time the ninth grade boy in me would smirk and make some veiled reference to anatomical conclusions, but I shall not!) What I didn't realize is that I shared them with you. This leads me to believe that in the last 221 posts, I may have inadvertently repeated a thought, an issue, exact wording.... Rest assured it is not from a lack of desire to overwhelm you with my pithy thoughts and/or my deep insight. It is instead, an indicator that I have trouble remembering what I had for breakfast (sausage and eggs, I believe! ), much less what I might have written in the distant past (okay, 7 days ago isn't so distant, but deal with it!). If my redundant repetition has you shaking your head wondering whether I've lost it, I am most impressed. That would mean at one time I had it! Should you ever look at these posts in their entirety (god bless you because you have very little to do to keep you entertained!) and you see similarities in posts, chalk it up to that stubborn refusal to re-read before I key! I apologize for any dismay this may have caused. It will not, however, change protocol. If I've said it before, it obviously is extremely important and deserves a second statement (or, as the case may be, chalk it up to the age, and the beers!). Redundantly, repetitively, and with a surety of recognition, know you are loved! When making coffee, one should place the coffee pot under the dispenser, not leave it sitting next to the dispenser and walk away for a period of time. Fresh air is good. A south wind with a south window open in the middle of February may be a little too fresh. A second pot of coffee tastes as good as the first that is on the floor heading for the drain. It's nice to know that the day should get better as it rolls along! I'm perverse. Some things just strike me as hysterical that probably should be sad, but I've learned to live with it. We were on our way in to visit Aunt Edith at the care facility this afternoon when a flash of orange caught my eye. Since orange is my favorite color, I decided to investigate. They say a picture is worth a thousand words. 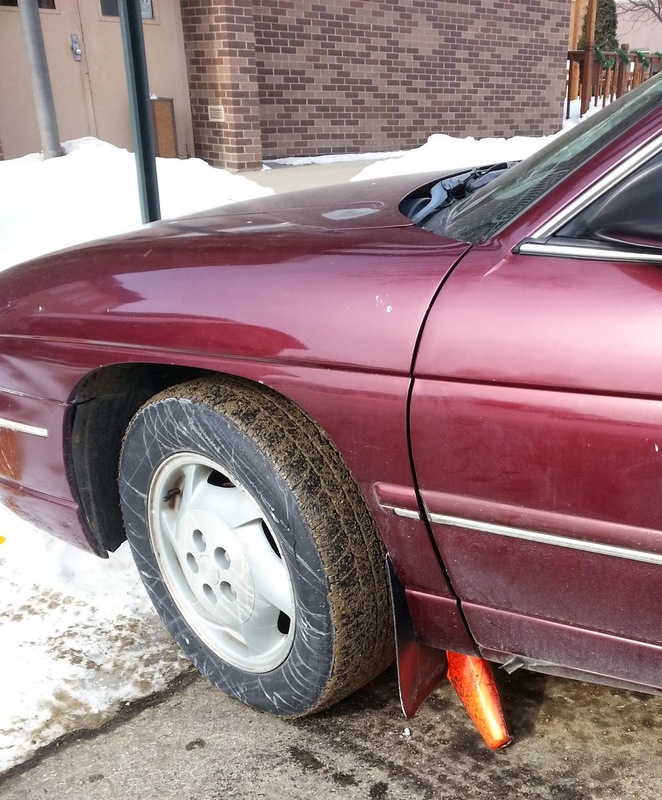 Perhaps the danger the cone is announcing is the driver of the car? Frank, by the way, is fictitious, and you, by the way, are loved! "I sing the body electric..."
Running has its own rewards, or so I am told. For me, it's the end! But it does give my mind time to wander (and so far, it has chosen to return, but I'm not holding my breath for that to continue!) Today, out of nowhere, in my head, it's FAME! I haven't seen or heard FAME for over a decade. And yet, there it was, loud and clear as it could be. Now understand, my body is not electric. In fact, I think several of the circuit breakers have been switched off! It's the next line that played over and over (as my subconscious provided the drum beat..."move your feet...move your feet"); "I celebrate the me yet to come." Whoa! There's more? I have been amazing blessed and amazingly lucky in my life. I found a love that would grow and sustain me. I found a vocation that would love and grow me. I found friends who would love and support me. And I get to play bridge. But apparently, I'm not done yet? Can't I just rest on my laurels (and my ample derriere) such as they are? No! Bertha used to say she wanted to wear out, not rust out. At 80+ she was caring for an elderly friend (who was 72!). At 90, she would go and do and care for her family and friends. When gravity and arthritis finally wore her down, her spirit still uplifted those around her. I want to be like Bertha. I'm not done yet. I do wonder what comes next, but it has to be something! There's lots of room for growth and improvement! "I drink to my own reunion". Heck, on any given day, I'll drink to anything, but running? You do serve a purpose. And you, my readers, are loved! You have to understand one of my basic tenets in life. Anything edible is better with butter, either in it or on it! And if you have ever been to one of my cooking classes, you will know that butter is not, nor ever should be spelled, oleo margarine! That being said, today's blog is nothing about butter. It's about the box it came in. Because of the aforementioned basic tenets, I buy butter by the case, and as I was walking toward the basement sink to do some dishes, I noticed an empty case. In big bold letters, it said ROTATE YOUR STOCK. This gave me pause. To keep things fresh, you need to constantly do two things. First, you have to get rid of the old stuff and second, you have to restock. I think I have become complacent in my senior years. I have a tendency to rely on the tried and true...the comfortable things in my life. I fear that a lack of new adventures may be leaving me a bit stale (and god forbid, rancid!) It's time to move the old out and replace it with something new. With any luck at all, this change will not be marital. It will not be in the people whom I love. Instead, it might be in something different during my spare time. It might be in someone different in my spare time. It might just be something that piques a desire to learn, to do, to accomplish. It could be as simple as trying a new hobby It might be in totally revamping a presentation. It might (with any luck at all) include a trip to Antarctica! Please don't get me wrong. In taking stock of my life, I realize how lucky, how blessed I am. An amazing woman to love. Friends who sustain me. Enough time and money to do things I enjoy...well, time, anyway. But that butter case is nagging me. It is time to rotate, but never, ever replace the ones I hold dear. Add to? Hopefully. Know you are loved! I am constantly amazed by the science of living. Our lives are easier because of the wonderful inventions that help us accomplish our tasks. (The third load of washing is in the dryer.) Our lives are more entertaining because of the inventions to provide stimulus and escape (the winter Olympics are on!) Our lives are more connected because of the dis-connectivity of our communication devices (I still hate to text. A flip phone is what I have...a flip phone is what I want...when I can find it!). The "good old days" must have sucked! But has the science of living overtaken the art of living? I remember when mom used to hang the clothes on the line, and carry on a conversation with the neighbors while doing it. They shared recipes. They shared gossip. They shared. I remember (vaguely) life before television. We used our imaginations to construct the sets, to paint the backdrops, to visualize the characters. (While flipping through the 600 stations we have last night, I needed no help in visualizing one of the characters. Those two things couldn't possibly have been real, but they were in living color!) We shared. And I remember the party phone lines. We SHARED! In all these instances, it was our creativity that was on call. It was the colors and shapes and structures that we developed in our mind's eye that thrilled and excited us. It was describing these to our friends that was the challenge (especially for those of us who couldn't draw a straight stick person!) But the art of living isn't in the colors, the shapes, or the structures. The art of living is in the one-to-one, in personal sharing. I suppose you have seen the apparent contradiction in my logic. Facebook. Twitter. Blogs. Don't we all share a little too much? Nope, because there is no physical connection to any of these. When I talk to someone, I prefer to see their response, listen with my eyes if you will, and know that a simple touch, a hug, a smile, can transform any normal occasion into a work of art. Know you are loved! I'm sitting in the sun. The television is tuned to Easy Listening. I'm day dreaming about our upcoming trip to Florida. All incontrovertible proofs that the secret stalker has caught up with me. When exactly did I become old? Contemporary music used to be my forte (okay, so I've always had a warm spot for the sixties oldies, but that's totally understandable and youthful, right?). Sitting in m recliner at 1:40 never used to be an option. And what could be more cliched than going to Florida for someone my age? Ah well, dotage doesn't seem such a bad thing! Having written this, I realize that instead of being a veiled attempt at humor, it might be closer to the truth than I want it to be! I really believe growing old is a choice (unlike growing older, which is a blessing and totally unavoidable if I want to be present!). I just changed the tv to golden oldies (and am doing the locomotion with little Eva)! I'm about to do a little consumerism (got my broomstick out and will fight with the company that wants me to pay the same bill twice), and am planning hikes I want to take while we are in Florida! Take that, you silent stalker! This 14 year old is ready to take on the world. Now, if I can only remember where the car keys are! Know you are loved! homoymns, synonyms, and antonyms, oh my! Weight...Wait. I have never had a handle on either of these. The epitome of Duncan toys has nothing on my avoirdupois over the last years of my life. Understand, from college graduation onward, I had enjoyed the 70 pounds I had gained while working at the snack bar in college. I carried it well (or so I tell myself). Then, the spirit took me and I quit smoking and lost 70 pounds. Put it back on. Lost 65 pounds. Put it back on. Lost 75 pounds. Have been inching up again. This time, I've decided to attempt to nip the full monty gain more quickly. For those of you who haven't caught it yet, I'm dieting again! But here's the thing. I can't wait until I can eat bread and potatoes again. And I can't wait for my body to decide it would rather be healthily thinner than comfortably fatter. But I guess I shall. Stubborn...German. The reason I think I can lose the inches I have found. Miss Loosewheel used to say that if I got up in the morning determined to do something, before I went to bed that night, I would have done it, come Helen Highwater (I think that's what she said. My mother never would have said hell...oh wait, yes she would have!). Besides which, we are going to Florida in two and a half weeks and I want to look good in my bathing suit. Okay, I want to be able to wear my bathing suit without causing uproariously laughter. Okay, I actually want to be able to walk on the beach in my bathing suit without Captain Ahab harpooning me and celebrating his final victory! And so it is written, and so it shall be done! Love...Hate. I hate dieting. I love eating. I hate gaining weight. I love losing weight. I hate that I have to assuage my desire for pie with low carb cole slaw. I love that I have found an amazing recipe for low carb cole slaw! Can you tell it's lunchtime? Here it is in a nutshell. Waiting is over. The weight comes off. Teutonically speaking, I shall eschew carbs until Florida. And for what it's worth, I hate the fact that Duncan ever invented the yo yo to describe my shape, but I love you! It was a late night. First thing this morning, I go to the basement, measure the coffee into the filter, turn on the Mr. Coffee, print off the habitual crossword puzzles, come back upstairs and hunker down on the couch in the man cave to watch news of the Olympics. Amazing time of the year for me. I am a true junkie, and am somewhat concerned about the readiness and safety issues for all participants and their present fans. Can't wait any longer for coffee. Head to the basement. Realize that coffee is easier to drink when you pour the water in the reservoir and not leave it in the pot! Sometimes, sharing the agony of defeat lessens the pain. But stupidity, unfortunately, is it's own reward! Hope your grounds and water meet on your first try, and know you are loved! Is it just I, Or are you also tired of hearing/seeing adds about sexual dysfunction? I remember when ED was a talking horse, and there was no need to talk about my testosterone levels. Whose business is it, exactly, whether when "the mood" hits me I am prepared to do something about it? (And what's with those bathtubs?). There are certainly enough areas in my life where I am inadequate, and yet I don't hear ads about a little blue pill it increase my patience, or an underarm dose that will increase my adeptness at playing the piano. Likewise, I don't care to hear about odor or that nagging itch for the ladies! Being somewhat research oriented, I am going to keep track for the next week how many times one of these "personal" ads airs. I bet you can hardly wait for the results. I'd say more, but as a very good friend of mine once opined, "bz, it 's time for your medicine!" Less personally yours, I remain standing straight (for over four hours without consulting a physician! ), able to motate on my own, and blissfully unaware of any offensive odors! And you are loved! Community U. is, in my estimation, an amazing offering to all of us in the community. Diversity reigns supreme in the offerings, and the expected commitment from the students is limited to one night. What a great way to get a little knowledge, have time with friends, and challenge the instructors to find a way to teach a subject in one offering! Cath and I are two of those instructors. Tomorrow night, I will be teaching a class entitled No Need to Knead. Yup. Bread. A week from tomorrow night, the two of us will be offering a class in beginning pinochle! How's that for diversity? It's been a while since we have been in the classroom. I had forgotten how much of any class relies on preparation! Tonight is dedicated to getting different stages of bread ready to show. ALL night. Each of the two breads has three different stages to go through, and it will only be fair for the students to see each stage! That makes timing integral, and since one of the breads is a 16-18 hour investment in time (about 10 minutes of actual work! ), planning does take the upper hand! We'll see if we can pull it off! Hopefully, these students will find the preparation Helpful, Handy, and end up Happy! If not, it could be a royal pain in the...well, that would be a different Preparation H! Know you are loved! It's finally here. After all the hype, the pomp and circumstance, the ads...the national anthem has been sung and we are underway. At least that is what I have been told. For some reason, my television doesn't get the game (that reason would be I don't tune it in!). I've never been a football fan. The hype interests me. I may tune in to see who Bruno Mars is but probably not. I do have a favorite in the game. Mr. Manning has always impressed me as a decent man, and I hear he's had an amazing year...and he's mature! I like mature people! But that's the end of the interest. There will probably be a movie on that will pique my interest, or I may just doze a bit. However, if you are a fan, I hope your team plays well, the game is exciting, and no one gets hurt! And after the next month or so, we will hear little of this game...I hope! Have an amazing week and know you are loved! We'd skip the rest, head straight to spring. The grass so green, the sidewalk clean? A dream that's soon not likely seen! The nerve of Punxsutawney Phil. I might find good in February! So with my candy don't be late! Is month like this? Thankfully short! I love you lots, you bet your bucks! Now, aren't you glad this isn't a rhyme a day site? Think Thaw!